I will never forget my first visit to the Everglades. Even with professional counseling. We knew there was trouble ahead when we saw the cans of mosquito repellent, littering the roadside like spent cartridges. There had been a fight. The visitors had sprayed until the repellent ran dry. They’d slapped until their hands were smudged dark and gritty. And finally, maddened, they`d run wild into the yellow mash of the Everglades, where the mosquitoes took them. Lifted them straight out of their shoes, sucked them dry and dropped the bloodless shells out in sawgrass, never to be seen again. We looked out on the battlefield, and we knew they must still be out there, thousands of them. We could hear the buzz. It’s been almost 25 summers since I wrote that story, my first byline in the Chicago Tribune. And I still haven’t forgotten my first visit to the Everglades. But, over the years, I have learned to stop dreading the Everglades and even to love it. It has taken time, powerful bug repellents and some gentle counseling from some great names associated with the River of Grass. Later – d’oh! – I noticed that many photos of the legendary Grandmother of the Glades showed her seated in a boat poled through the sawgrass flats. That must have been what she meant – only a fool would go out there and slosh around. She didn’t visit the Everglades, young man, she floated! I pressed my question, and Mrs. Douglas eventually revealed that her favorite place was the Pahayokee Overlook, just off the main road not far from the park’s entrance. That seemed like a pretty tame place, I thought. Even a little touristy. Maybe she was just trying to shake a young reporter and his pesky questions. Until I visited (yes) the Everglades a second time, walked up the boardwalk ramp at Pahayokee Overlook (wheelchair accessible) and looked out as Marjory Stoneman Douglas had instructed over her beloved River of Grass. And from that spot, just a few feet above the flat water, I could see the very curve of the Earth off in the distance. What a wonder, I gasped. Sky and water. Flora and fauna. The sight lifted me straight out of my shoes and dropped me into a sense of my place in the cosmos: That is to say, a speck. A shell in the sawgrass. And a part of it all, just the same. I thought about that day as I listened last month to Clyde Butcher, another great name from the Everglades, who’d come to speak at the Miramar Cultural Center. 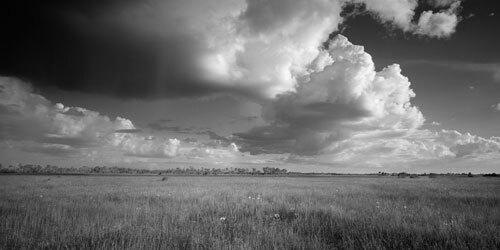 Marjory Stoneman Douglas would have scolded Mr. Butcher, I think, because he doesn’t “visit’’ the Everglades in pursuit of his iconic black-and-white photography, on display through August at the center. Mr. Butcher wades into it – sometimes waist to neck deep. Short of sloshing into that yellow, buzzing mash, you can experience the Everglades through Butcher’s intriguing photographs, which Jonathon King writes about this issue on pg. 78. Or by walking the boardwalk Marjory Stoneman Douglas suggested at Pahayokee. Or, my favorite, riding a bike (faster than the mosquitoes, this time of year, can fly) down the old fire road in Shark Valley. Everglades Restoration, by Clyde Butcher – the image he says he thinks of when he thinks about summer in South Florida.